Welcome to my crafting blog. 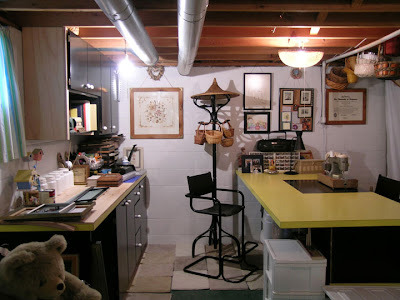 I plan to share my creative endeavors that I do in my studio, a basement studio that I created when we remodeled our kitchen a few years ago. I reused some of the old cabinets and counters by having them moved into our unfinished basement. I designed the layout and the carpenters did the rest. Thus, my "studio" began. That was a creative feat in itself! I have became more interested in stamping and making cards thanks to my neighbor and friend, Rita, who invited me to join her stamping club, "Last Monday Stampers".